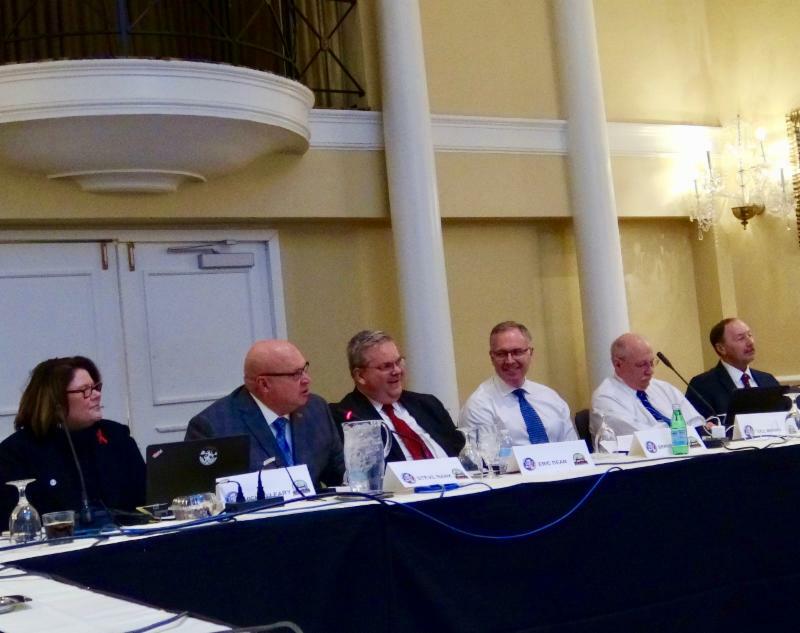 Iron Workers-IMPACT Safety and Health Roundtable was held on December 13, 2017 at the Mayflower Hotel in Washington, D.C., to address current safety and regulatory matters. The event featured many new safety and health developments and regulatory updates to improve safety performance in the workplace. 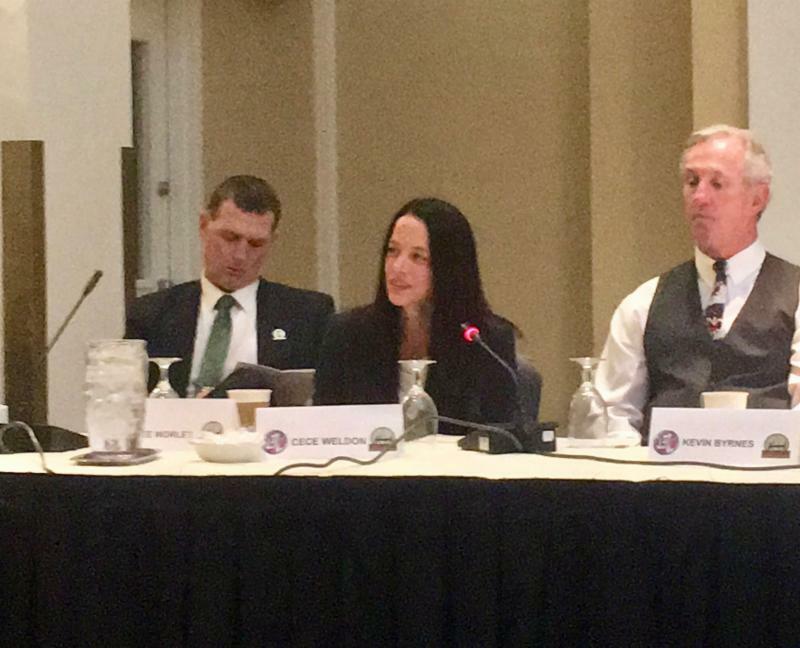 Iron Workers International (IW) General President Eric Dean, General Secretary Ron Piksa and Secretary Steve Rank updated the roundtable members on the 2018 Zero Incident Campaign and new opportunities to increase safety performance. AECOM was recognized for upholding high project safety standards on the TVA project when the ironworkers helped discover materials that possibly contained asbestos. Iron Workers International (IW) General President Eric Dean thanked AECOM for taking swift action to keep the workers safe. "We can train our workers to be safe but without employer cooperation, it would be impossible," said Dean. In response, Jayme Hobson from AECOM Shawnee Clean Air Project said it was the keen eyes of the ironworkers that saved the day. "The ironworkers did everything right. When they saw something that didn't look right, they used their training and experience to prevent a potentially harmful situation. It makes it easy to do the right thing when you have such a great team." 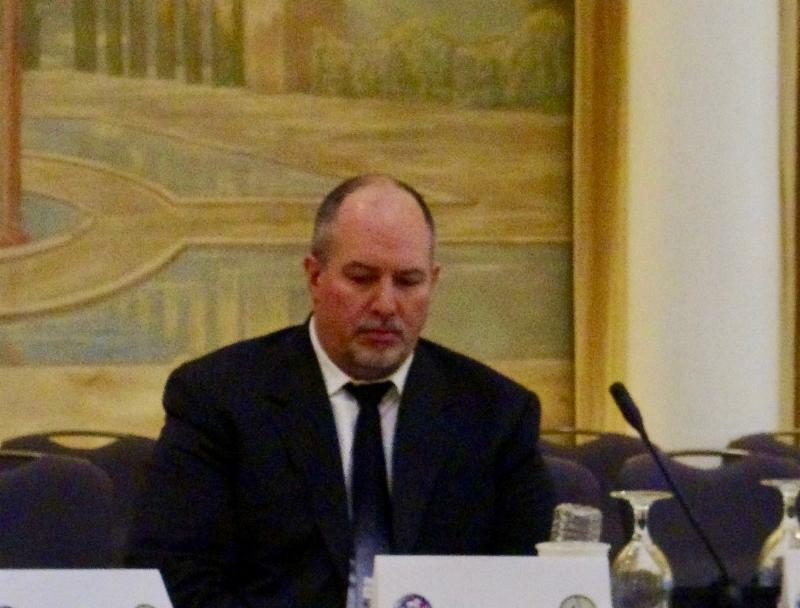 Executive Officer of California Occupational Safety and Health Standards Board Marley Hart explained the difference between a waiver and variance and the application process for a permanent variance. She noted that the California Occupational Safety & Health Standards Board is a separate entity from CalOSHA and it makes all decisions on whether to grant or deny an application for variance. She further noted that the application process is an extensive process, which could take up to a year. 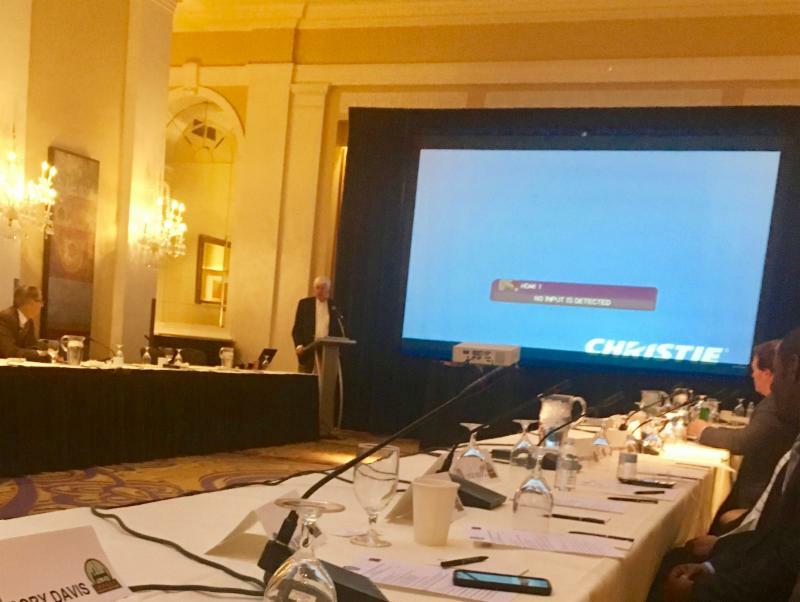 Chairman of the Lift Group, LLC Charles Thornton showcased a new groundbreaking innovation in engineering and safety, the newly patented Lift System. Lift System takes a cutting-edge modular approach to engineering where building floors are built on the ground, lifted up and locked into place. "It is the safest way to build," said Thornton. "Crews work near the ground on a slip form, which has rails all around. They can tie off if they'd like, but there's no need for it. Once the exterior wall is on, the lifted top floors are enclosed, so there's no risk of falling"​ The LIFT System presents a solution to the top hazard in the construction industry and eliminatesthe need for fall protection. The pilot project was successfully completed in Bangalore last year and the company is planning several projects this year in North America. Kevin Turner from White Construction said that the company has worked with 18 IW locals and generated 163,000 work hours, mainly working on wind and solar farms. He mentioned that the company is venturing into high level safety training similar to the successful IW Safety Director Training Course. White Construction has created a new safety position, equipment superintendent. Cece Weldon from AECOM shared the story of theTVA Project where the ironworkers helped mitigate a potential safety hazard. Bill Mott from Associated General Contractors and Herb Strong from Haztek, Inc. shared their insights and safety updates. IW Executive Director or Safety and Health Steve Rank announced plans to launch the new ironworker-specific safety supervisory training course during the Annual Ironworker Instructor Training Program in July. He updated roundtable members on the popularity of the Ironworker Safety Director Course (IWSTDC). Written examinations will be included to evaluate competence. IW Organizer Vicki O'Leary updated the roundtable members on diversity. She shared the story about discovering that a pregnant ironworker woman was working around toxic paint while processing her claim for paid maternity leave. The contractor on the project didn't have a respirator program. She further noted that harassment on the job creates a hazard. "Safety and diversity go hand in hand," said O'Leary. She added that the "Be that one guy" campaign includes both men and women who are harassed on the job. IW Canadian Safety Coordinator Jeff Norris joined the meeting via Skype to share an update on Canadian safety and health initiatives. There are 21 IW locals servicing approximately 1,500 contractors in Canada. 2017 was a year without any fatalities in Canada. Norris presented data on construction activity by province and mentioned that Ontario is Canada's "shining star" with the highest number of projects. He noted that Western Canada experienced a 22 percent decline in construction largely due to political activity last year. In Canada, there are no established federal standards for steel erection. The Canadian IW leaders have been working on aligning legislation with the 1926 OSHA Subpart R safety standards in the U.S. They have begun establishing a set of best practices to serve as the overarching safety standards in Canada.